When it comes to portable Bluetooth speakers, those are dime a dozen, where we have seen some pretty notable releases in the past such as the Braven 440. However, how many of those are actually rugged enough to be able to stand up to the rigors of your adventurous lifestyle? Divoom sees this particular niche as one that has to be filled, which is why they have come up with the Voombox-Ongo portable Bluetooth speaker that produces amazing sound without breaking the bank. 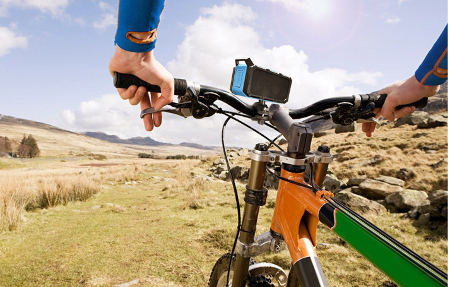 The next time you go cycling or whitewater rafting and would like to enjoy some music on the side, you might want to consider purchasing the Voombox-Ongo before that trip or outing. After all, it is water resistant in the first place, and has been specially designed to attach to your bike thanks to the included mount, although it would also be able to be carried around in a backpack if you so desire. With an 8-hour battery life, chances are you might be done with your cycling for the day before its batteries even run out in the first place. The Voombox-Ongo is not only portable but versatile, and it can be used in indoor and outdoor environments, where it boasts of a range of colors that start from Light Blue and goes all the way to Light Green, Red, Orange and Black, allowing it to keep up with just about anybody’s style. It is not going to break the bank either with an asking price of $69.90 a pop. Specially equipped to handle a rugged lifestyle, the Divoom Voombox-Ongo is also at home when you go camping, backpacking, bike riding and nearly any other extreme activity. As the weatherproof speaker come equipped with the latest Bluetooth 4.0 technology, it works great with any Bluetooth enabled device out there, all within 32-feet of working wireless range.